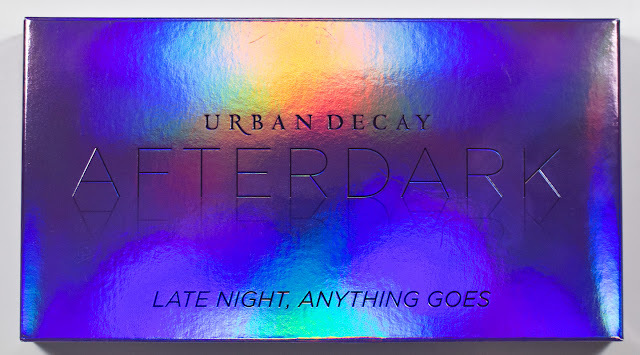 The Urban Decay Afterdark Palette retails for $49US or $59CAN for 10 x 0.06 oz/ 1.7 g worth of product. Talc, Diisostearyl Malate, Dimethicone, Zinc Stearate, Calcium Sodium Borosilicate, Synthetic Fluorphlogopite, Polyethylene Terephthalate, Silica, Caprylyl Glycol, Calcium Aluminum Borosilicate, Phenoxyethanol, Hexylene Glycol, Tin Oxide, Tetrasodium Edta, Polyurethane-11, Aqua / Water, Isobutylphenoxy Epoxy Resin, Polymethyl Methacrylate, Polybutylene Terephthalate, Polylactic Acid. [+/- (All Shades May Contain): Mica, Ci 77891 / Titanium Dioxide, Ci 77491, Ci 77492, Ci 77499 / Iron Oxides, Ci 77742 / Manganese Violet, Ci 77007 / Ultramarines, Ci 77510 / Ferric Ferrocyanide, Ci 75470 / Carmine, Ci 19140 / Yellow 5, Ci 77163 / Bismuth Oxychloride, Ci 77000 / Aluminum Powder]. Talc, Diisostearyl Malate, Dimethicone, Caprylyl Glycol, Phenoxyethanol, Hexylene Glycol, Tin Oxide, Zinc Stearate. [+/- (All Shades May Contain): Mica, Ci 77491, Ci 77499 / Iron Oxides, Ci 77891 / Titanium Dioxide, Ci 75470 / Carmine, Ci 77510 / Ferric Ferrocyanide]. Diisostearyl Malate, Talc, Dimethicone, Alumina, Caprylyl Glycol, Phenoxyethanol, Tin Oxide, Zinc Stearate, Hexylene Glycol. 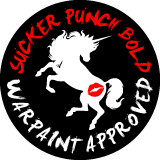 [+/- (All Shades May Contain) : Ci 77891 / Titanium Dioxide, Mica, Ci 77163 / Bismuth Oxychloride, Ci 77491, Ci 77499 / Iron Oxides, Ci 42090 / Blue 1 Lake, Ci 77510 / Ferric Ferrocyanide, Ci 77510 / Ferric Ammonium Ferrocyanide, Ci 19140 / Yellow 5 Lake]. The Urban Decay shimmer formula is the best that the brands offer. 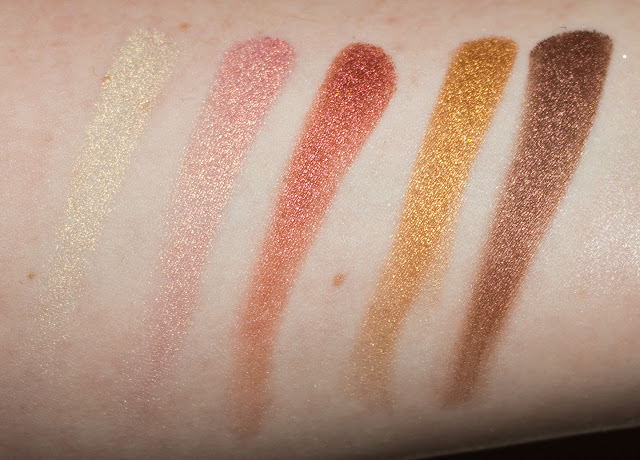 Only two shades I found slightly sheer in this palette which is Druggie and Paralyzed. These are blend nicely and a consistent texture. Alter is a pale white-gold with gold shift and shimmer finish. Scene is a pinky-peach with gold shift and shimmer finish. Supersonic is a red with a copper and shimmer finish. 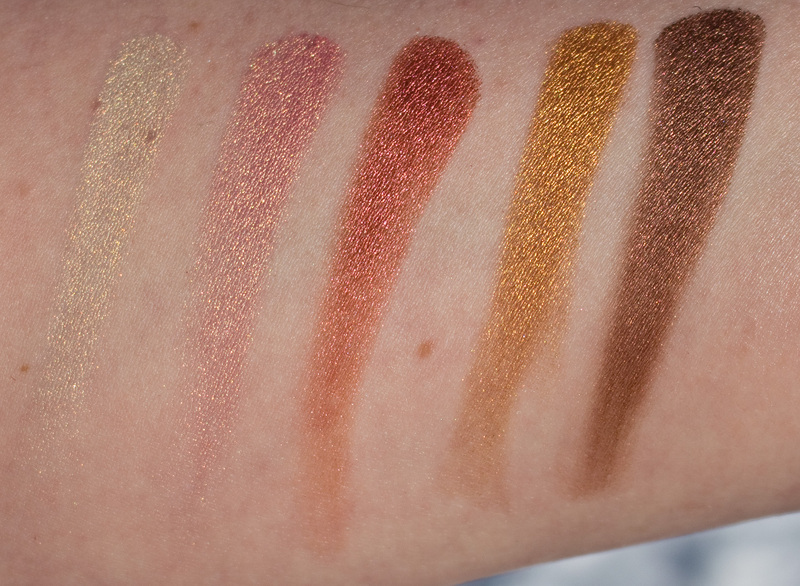 Sinful is a gold with a light orange and shimmer finish. Off Duty is a metallic brown and shimmer finish. Druggie is a purple with a violet micro-shimmer finish. Backfire is a burgundy with a purple shimmer finish. Lounge is a brick red base with a green shimmer finish. Fringe is a bright teal with a shimmer finish. Paralyzed is a navy with a shimmer finish. Wear: I get a good 6+ hours with Urban Decays shimmer formula on their own. Packaging: This palette box is my favourite they have put up for packaging. The lid with the full mirror and a sturdy hinge that holds it position so that you can use it as a table top mirror. It also not too heavy! 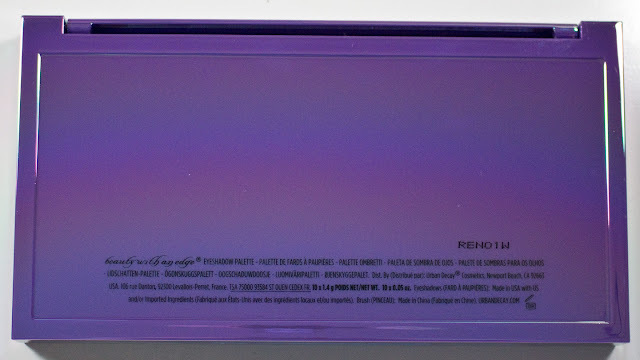 The outside packaging is an oil slick rainbow over reflective mirror purple. The box is a holographic film done over a purple base. 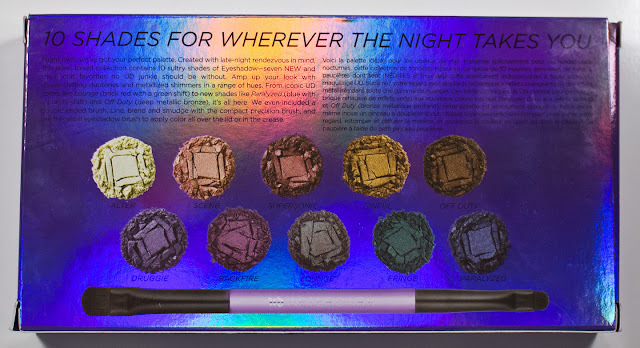 Double Ended Eyeshadow Brush is nice and identical to the Electric Palette version. I wish the shadows brush end had more of a dome shape rather than a box round corner shape at the tip as that shape that works best for picking up powder products, but it still gets the job done. The short end is great for detailing. 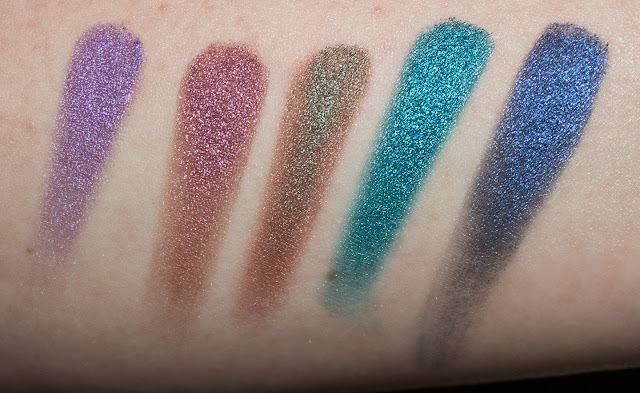 Daylight swatches: Alter, Scene, Supersonic, Sinful, & Off Duty. 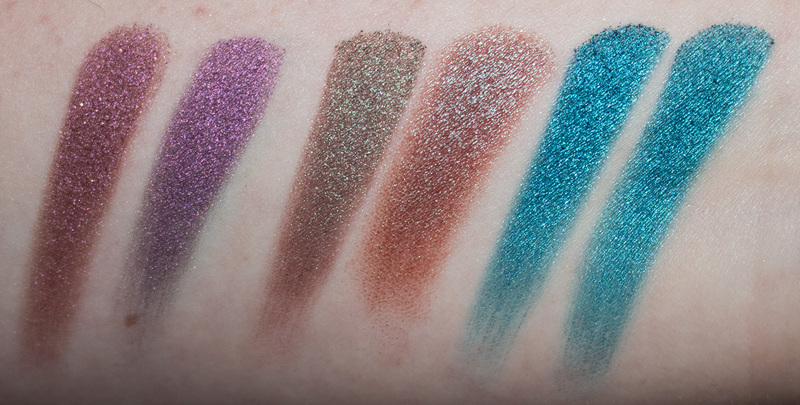 Flash swatches: Alter, Scene, Supersonic, Sinful, & Off Duty. 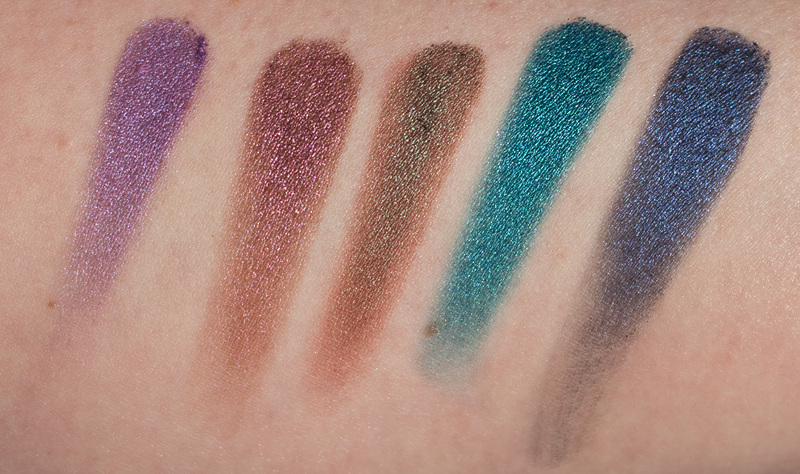 Daylight swatches: Druggie, Backfire, Lounge, Fringe, & Paralyzed. Flash swatches: Druggie, Backfire, Lounge, Fringe, & Paralyzed. Urban Decay Afterdark Palette, Backfire, Lounge, Fringe, and Urban Decay pans Backfire, Lounge (Mini), Urban Decay Electric Pressed Pigment Palette Fringe. Daylight swatches: Afterdark Palette Backfire, Urban Decay pan Backfire, Afterdark Palette Lounge, Urban Decay pan Lounge (Mini), Afterdark Palette Fringe, and Urban Decay Electric Pressed Pigment Palette Fringe. 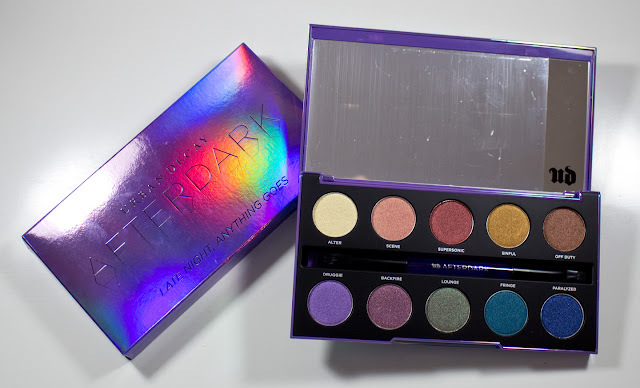 Flash swatches: Afterdark Palette Backfire, Urban Decay pan Backfire, Afterdark Palette Lounge, Urban Decay pan Lounge (Mini), Afterdark Palette Fringe, and Urban Decay Electric Pressed Pigment Palette Fringe. 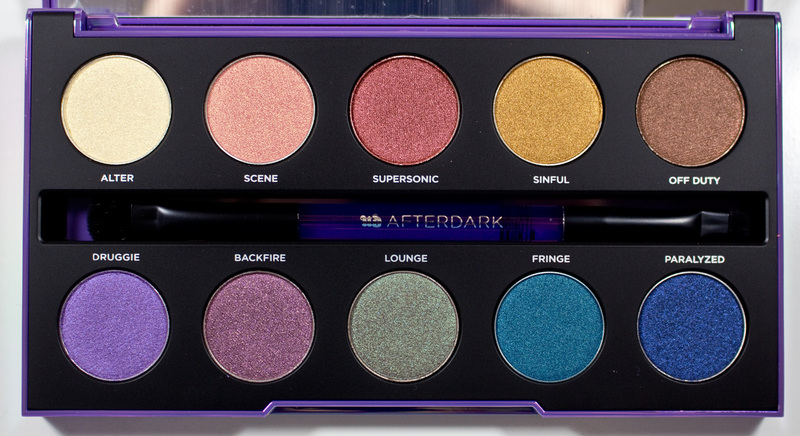 Afterdark Palette Backfire is much warmer compared to the full-size Urban Decay pan of Backfire. 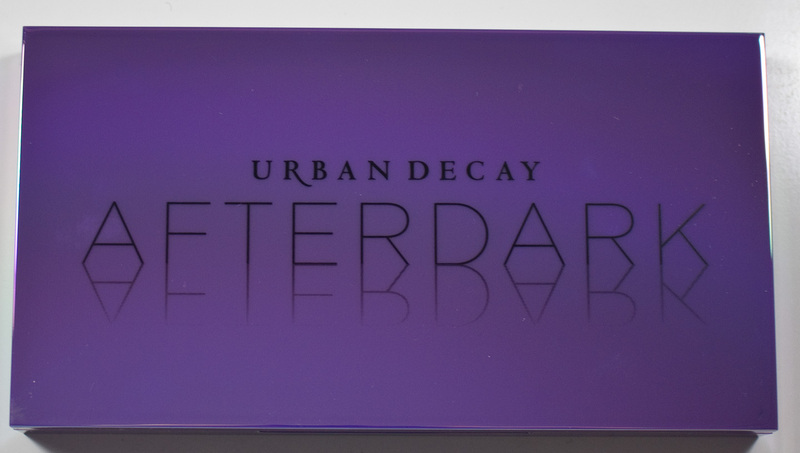 Afterdark Palette Lounge has a stronger green sheen than the Urban Decay pan Lounge (Mini) which leans more teal in colour. Afterdark Palette Fringe is slightly bluer compared to the Urban Decay Electric Pressed Pigment Palette Fringe but it's pretty much identical.